In addition to Los Angeles’ Palm trees, Warren Techentin’s Tree Huggers Chapter briefly mentions that the most widely planted non-native trees in California were varieties of the Australian Eucalyptus, or as Techentin describes it, “the Eucalyptus Crusade in which thousands of acres of the trees were cultured from Australia and obsessively planted throughout the state.” In direct contrast to palm trees, Eucalyptus were imported and planted for practical ‘performative’ uses, such as windbreaks, firewood and shade. The century-plus legacy of these plantings is still evident throughout the City of San Francisco, where they can be found all over Golden Gate Park, the Presidio and just about everywhere else. 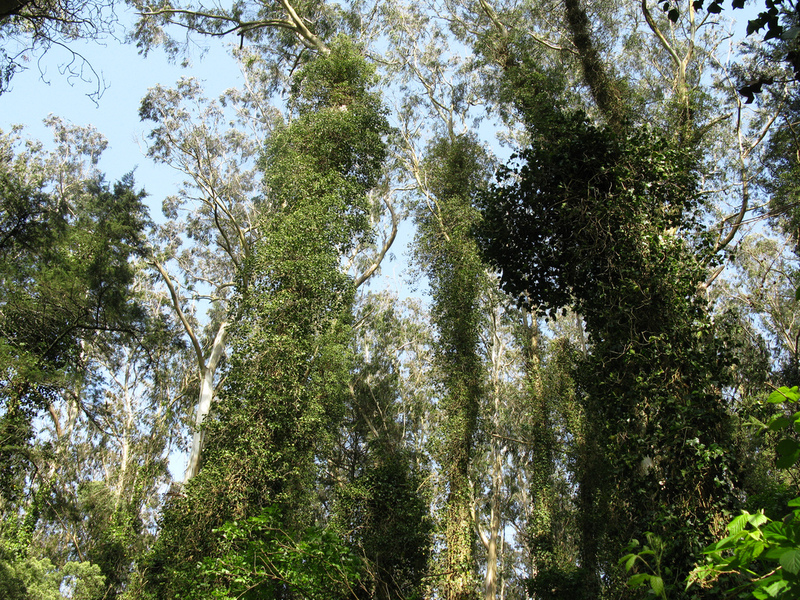 One of the most intriguing of these vegetated habitats is the Eucalyptus forest on Mount Sutro. Located nearly dead center in San Fransisco, the 80 acre forest was intentionally planted with Eucalyptus beginning on arbor day of 1886. 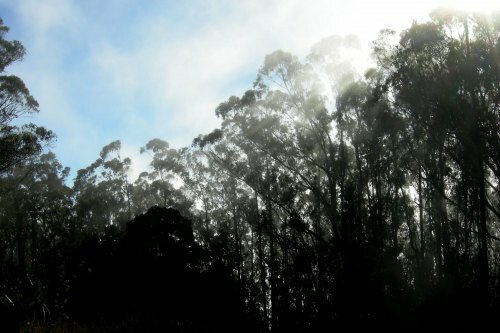 The current Mount Sutro forest is a remnant of the more than 1,000 acres of planted Eucalyptus forest that once covered the western side of the city. I used to live about a five-minute walk from this forest and subsequently spent a significant amount of time there. One of the most memorable features of the forest was how uninhabited it was by people. As most of the steep inclines on which the forest sits are on private land, its presence was not advertised, and thus it just wasn’t on people’s radar. There were no trail maps of the forest that I was aware of, which made it all the more fun. I went there to try to get lost. 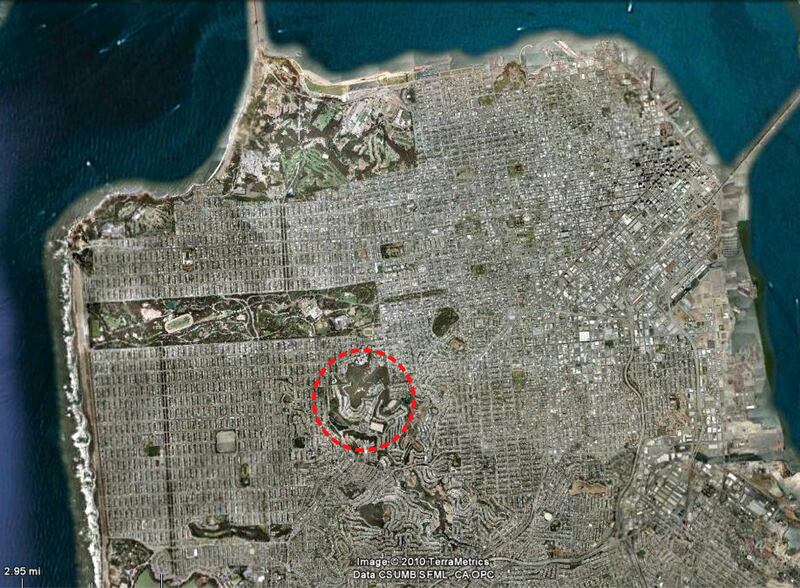 On pleasant days there would be thousands of people in nearby Golden Gate Park, but no one in the Sutro forest. In a twist of Olmstedian logic, I would climb up Mt Sutro, rather than go to Golden Gate Park to retreat from the intensity and crowds of the city. 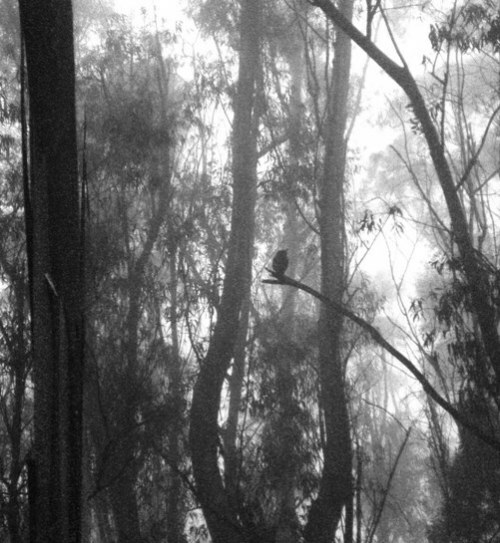 For years the forest was largely left to itself, building a unique ecology composed of ruderal, invasive and native species that could coexist with the Eucalyptus. The physical experience of being in this forest is fascinating and truly unique. The 100+ year Eucalyptus are now 100-200′ tall, forming a high airy canopy. The sheer size of the forest is a wisp, anthropogenic counterpoint to the region’s towering redwood forests. The light, textured shade that Eucalyptus trees provide is visually exquisite. The terraforming of these hills with Eucalyptus has inadvertently created a harvester of clouds. Like a massive net, tree foliage captures condensation that would otherwise pass by, rendering the microclimate considerably more wet (an additional 30%) and thus more vegetated than it probably ever was throughout its long pre-forested history. The growing forest has begot more forest. As historians have demonstrated, the native ecology of San Fransisco consisted of grasses, forbs and scattered shrubs, but was mostly bare, sandy and less than hospitable for urban living. It certainly was never forested. And similar to Mt. Sutro, Golden Gate Park was a much larger terraforming project – transforming large swaths of shifting sand dunes into an urbane botanical pleasure ground. Almost the entire surface of the bay area peninsula is fully constructed. 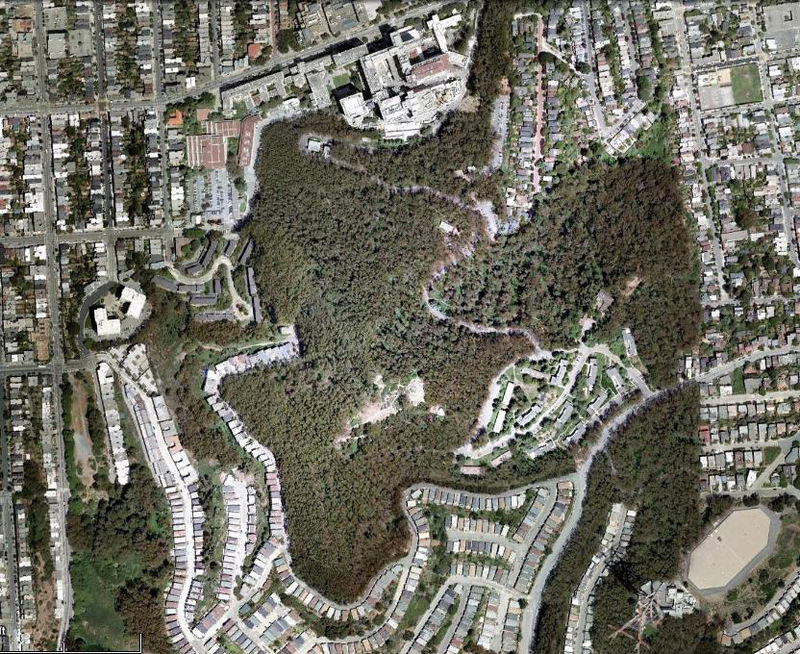 In the years since I left San Francisco, a lot of changes have occurred on Mt Sutro. A large area near the summit was cleared of Eucalyptus trees (evident in the closeup aerial above) and a meadow of native plants put in its place with the hopes of creating habitat for endangered butterflies. 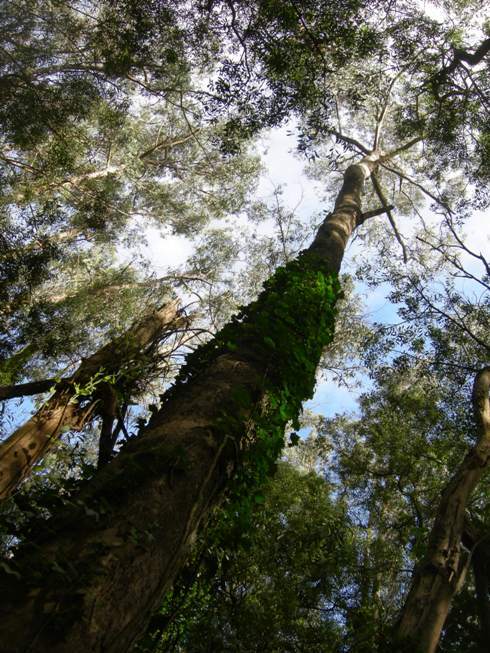 Proposals for thinning the trees have been debated and further selective replacement of the Eucalyptus forest have been proposed. Trails have been cleared and new ones created. Native plant societies are clashing with grass-roots organizations that hope to save the naturalized forest. Ironically, environmentalists are suddenly on the side of being destroyers of habitat. The services that the forest provides is being fiercely debated along with the ‘nature’ of its ecology. At the time the Eucalyptus trees were planted, none of this was on anyone’s mind. The trees were planted strictly for the benefit of people – firewood, windbreaks, shade. No one knew that the trees would evolve into a unique, naturalized and self-sustaining forest that places it squarely in contemporary debates in urban ecology and forestry 120 years later. This includes issues we have discussed at length at this blog, and which mammoth covers in their introductory post for this chapter, including nativism, weighing the benefits and problems of weeds and invasives, implications of defining humans as an omnipresent continuous disturbance regime, classifying ecosystem services, etc. 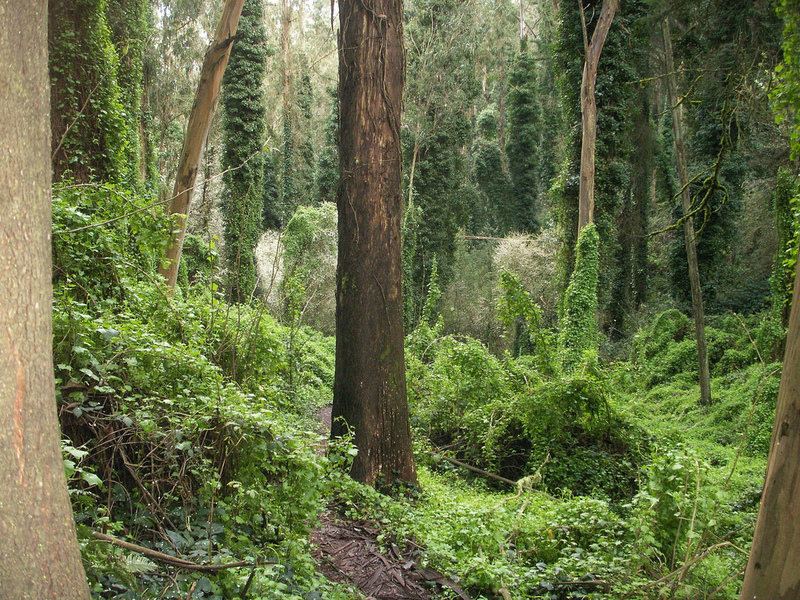 Rather than provide my opinion on this one, I would like to direct you to a fascinating blog that can provide a stronger grounding in the specifics of the local ecology: Save Mount Sutro Forest. Obviously their title lets you know where they stand, but what I value about the site is its open dialogue on the issues (contrary views are encouraged and posted) and its rigorous pursuit, study, and investment in a locally specific ecology. By locally specific I don’t mean native, but rather a thorough observation of the unique collection of forces and interactions as embodied in the specificity of site. On their blog you can read about what species are found in the forest vs. surrounding habitats, find links to latest pertinent scientific studies and contrary viewpoints, debunk various myths that surround Eucalyptus and learn how long Eucalyptus live (the ones on Mount Sutro could continue on for another 300 years…and if you chop them down, they re-sprout from the trunk for up to nine years). It’s this type of rigorous testing and exploration that might foresee a productive future for the Sutro Forest and lead to landscape as an ongoing foundational infrastructure. So grabbing the bit from the previous post, where you mention Geoff’s “Crypto-Forests” flickr pool, and also pulling in the little tags you gave the photos of crypto-Portland (urban prairie, urban cliff, etc. ), I’m thinking — in light of this post as well — that while photographs of “spontaneous urban forests” are fascinating in and of themselves, what is really helpful and useful is understanding the context of these vegetative eruptions. Learning to read “crypto-forests”. Which could be approached both from the local and specific, like Save Mount Sutro Forest, and from the general: maybe a companion to del Tredici’s field guide (which deals with individual species) which would begin to catalog and generalize about the origins, growth, function, composition, futures, etc. of spontaneous urban associations (I think “association”, rather than “ecosystem”, is pretty clearly the right analog from ecology). Great catalog idea – an associative field guide to urban flora and fauna organized by patterns of habitat…we should work on a prototype. There’s a great predecessor to del Tredici’s field guide that I recently got a copy of (for the Pacific Coast) called The Natural History of Vacant Lots, published back in 1989 that comes pretty close to this, approaching open lots and roadsides as ecosystems. The first part covers ecological associations, seasonal patterns, food webs, etc, and the latter half providing I.D. for flora and fauna. It has these great hand drawn black and white vignette diagrams. Yeah! I think such site-specific readings of the urban forest ties in with your comment from the last chapter on embodiment and the linking of scales of infrastructure (and indeed, it was my motivation in linking these past two posts). It seems there are landscape architects that are really into plants and what they can do and those that are not. This type of specific, physical engagement with the vegetative processes of the city offers the opportunity to link generalized theory to practice, aesthetics (and iconography) to performance, and perhaps a synthesis of the specializations of the gardener and the landscape architect. Nice series of posts here that brings into relief a couple of points for me. The idea of urban vegetation as performative infrastructure in addition to regional iconography is compelling but I think that the infrastructure metaphor is limited and short changes what is going on. Your work points this out very clearly. Traditional infrastructure is an engineered system guided by policy and requiring construction and maintenance. While those mechanisms are indeed at work in urban vegetation, there is also far more going on. Yours and mammoth’s interest in volunteer communities/associations is precisely because of the mechanisms operating outside of traditional infrastructure- the plants and associations that develop and organize without intended intervention and maintenance, or as a result of some other intervention or operations mechanism. In addition, the term infrastructure has come to be disassociated with layman intervention- it is the purview of technocrats and bureaucrats- and it mysticizes the mechanisms of the urban landscape rather than encourage inhabitants to understand it and intervene in it. Lastly, what we think of now as infrastructure- roads, bridges, ports, urban vegetation, whatever- existed long before the term “infrastructure” did. In short, I think the infrastructure metaphor is not big enough for the landscape and wish it were not so prevalent. Thanks for this post and the kind words about our website. And thanks also for this fascinating blog. Its always heartening to find others who care for the forest. I personally find it magical, but your descriptions capture that better than I ever could. Wonderful writing! Thanks for such a thoughtful and sensible article. I appreciated that you called attention to the reality that the supposed “environmentalists” in this case are the ones calling for habitat destruction, and who don’t seem to respect the ecosystem. In their zeal for their favorite plants, they insist that other plants don’t even have a right to exist. This forest is beloved by many exactly for its wildness, and should be left to evolve. This is no time for humans to be attacking forests – they are already under attack from climate change and environmental toxins. We need them more than ever! Thanks Sutro. I love the forum you’ve created.